More quinoa anyone?! 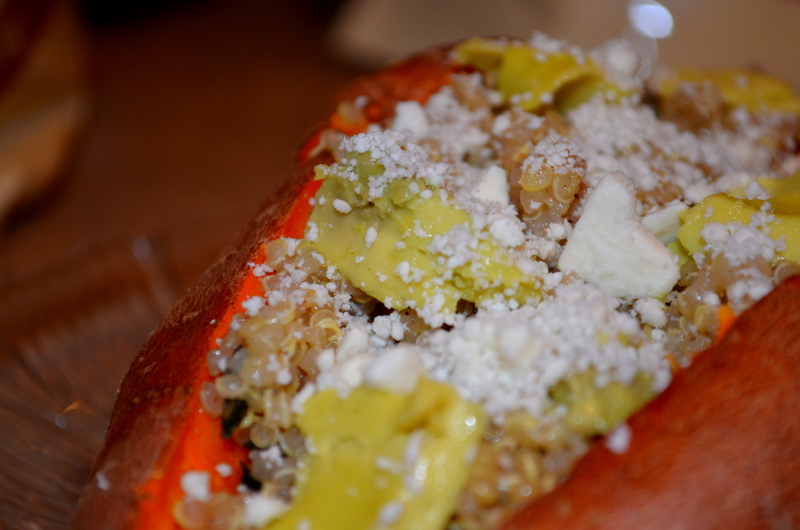 🙂 Why not stuff a sweet potato with quinoa, spices, avocado, and feta cheese?! I randomly came up with this idea last night, and it totally worked! And it continues to do my heart good when I cook yet another recipe involving sweet potatoes that my hubby likes! Chop your garlic into small pieces. In a small saucepan, saute the garlic and basil with 1 tbsp of olive oil. When quinoa is all ready, pour the garlic and basil over it, along with the nutmeg and black pepper, mixing well. Your potatoes should be done now. Put each on its own plate, slice them open and stuff them with the quinoa. Split the feta cheese between the two potatoes, and then spoon out some avocado for each. Thank you so much Marcella! I’m so glad you stopped by….I am excited about your blog! Great combination of flavors yet again, Lori! Thanks Patty! Always the encourager….thanks for that! Lori, I just saw this link on FB and thought of you!! Wow Patty! I just bookmarked the recipe….delicious! Thanks for thinking of me…so sweet of you! OMG yesss. I have been thinking of how wonderful stuffed sweet potatoes would be for work lunches, and here you’ve created the perfect one. I can’t do avocados, but I was thinking artichoke hearts would be a great substitute. Saving this! I am so glad you found this recipe then! Yay! Sweet potatoes are so yummy, aren’t they?! They’re wonderful! And I love knowing that I’m nourishing my body while eating them!